In the four days since its release, some three million internet users have downloaded the latest version of Internet Explorer. But security company Secunia has warned of another flaw in the program. As Microsoft announced that more than three million people have downloaded Internet Explorer 7 , Danish security firm Secunia said it had found a second flaw in the browser. The first security flaw was found only hours after the release of IE7, but Microsoft blamed Outlook Express for the problem. See Microsoft's comments on the matter on its Security Response Center blog . However, now Secunia has said that IE7 contains another bug, one that makes it possible for hackers to place a false web address in a pop-up window. Users may then be tricked into downloading material from a website they think is secure, when it in fact links through to a spoof website. Microsoft admitted that there may be a problem, but no technical information on the safety flaw has been issued from the company. Secunia describes how the IE7 bug looks on its website. Microsoft is hoping that the interest in Internet Explorer 7 will reach record levels, and so far it looks like they have succeeded. When the next Windows update is made available next month, the number of users is predicted to rise dramatically as the web browser is to be included in the download. It will then be circulated to all users of Windows XP SP2 and Windows Server 2003. 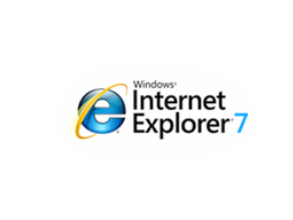 "Internet Explorer 7 has yet to be made available in various languages, and then of course there's always Windows Vista," Tony Choir at Microsoft's IE7 group said. In the US, Microsoft is pushing IE7 through radio commercial and mobile poster campaigns in larger cities. The company is clearly looking to take back market shares from rival Firefox, which previously accounted for 12 per cent of the browser market. None of the two reported problems are considered critical.